Trip Around the World Wedding Quilt in blues and greens, with grey border. I've told you well before this that I'm no great sewer. Oh, I get by, but it's not what I would call a natural talent of mine. And let me tell you I'm not being coy writing that, just truthful. There are some things I am good at, sewing is not one of them, I wish I was better at it. So it should go to show you that patch working, once you know the rules and short cuts, is quite easy. 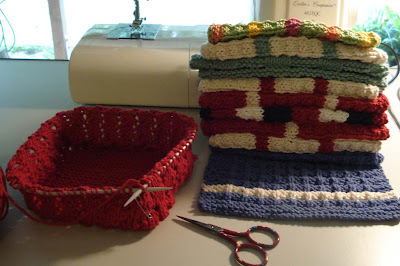 If you haven't tried it yet, and would like to make things like quilts, bags and cushion covers, find a mentor or a good book and dive right in. 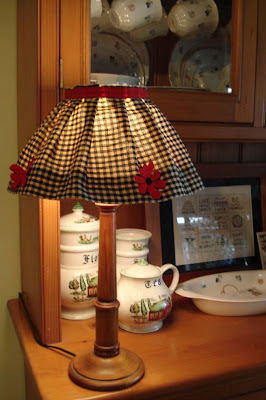 It is a wonderful way to recycle old fabrics and make fabulous gifts. It's so satisfying when you see the finished article that was once a jumble of assorted fabrics. 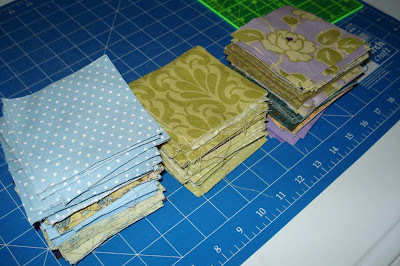 The most difficult part is working out your combination of fabrics and piecing your pattern together. I started it in late March, and got stuck after I had cut all the fabric and decided on a pattern. When I put it together, I didn't like my colour combination. So I waited until Tricia came up and she helped me look at it in different ways. She also told me I didn't have to cut all my squares, I could have done it in strips. I will do that next time. 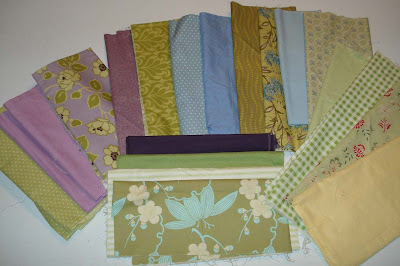 This is the most difficult part - choosing fabrics and matching colours and patterns. 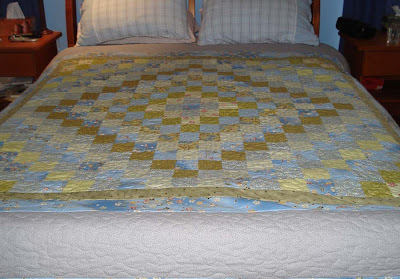 Working with an experienced quilter made the whole process much easier. 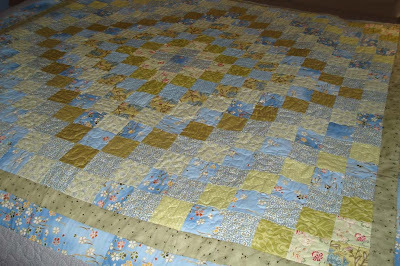 It was still time consuming and repetitive, but when we got to the end, with all the hand stitching, I really loved sitting with the quilt over my knees, stitching the edges. My DIL Cathy teaches patchwork and sewing so we took advantage of her offer to come over and use her huge table for pinning the layers together. She then kindly offered to do the quilting on her quilting machine - you can see this best on the grey border - it's the squiggly lines, called stippling. 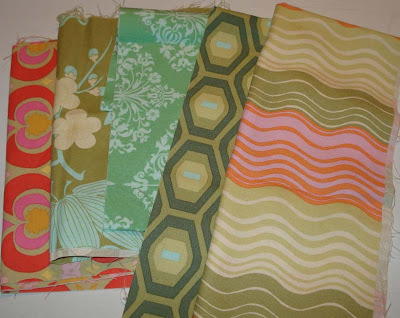 The backing is a pure cotton sheet that I bought when I first left home in the 1960s. It's white with a tiny flower pattern and is still in good condition. On the advice of Tricia and Cathy, I made a linen hand stitched label that I attached to the back of the quilt. It states: Trip Around the World Wedding Quilt, their names, date, and where it was made by Rhonda, Tricia and Cathy. Sarndra was overwhelmed when we gave it to them and she cried. It was a very special moment. And for those of you who wanted to see a close up photo of the cake, here it is. Shane and Sarndra with Hanno and Tricia in the background. It was a beautiful day full of beautiful people. Shane and Sarndra made me so proud as they progressed through their day. Shane worked hard right up until 2pm when we all realised we had to have showers and get dressed. Guests started arriving shortly afterwards and Sarndra arrived at 3pm. The ceremony was conducted in the front garden under the rose arch and luckily, even though it was the midst of winter, a hand full of perfect tiny pink roses swayed gently in the breeze. 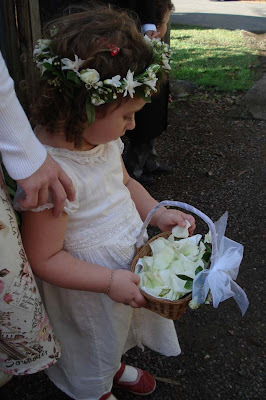 Flower girl, Isabella, and ring boy, Noah, led the bride, with her parents, Sue and Chris, into the garden to the waiting groom. Ring boy, Noah, getting to know a very shy Isabella. We circled the couple while they were exchanging vows and when the ceremony was over, Shane and Sarndra went up the mountain to have more photos taken (a wedding gift from Jens and Cathy) while we invited our guests into the backyard for wine and snacks. 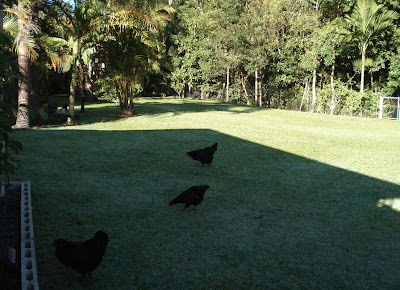 It was still light then so many of them wandered through the vegetable garden and looked at the chooks. 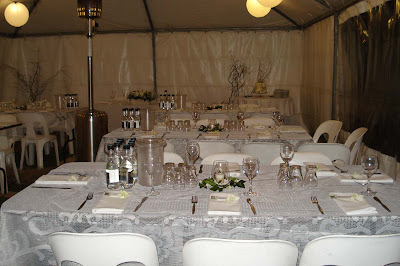 It definitely was an unusual setting for a wedding but many of the guests commented how lovely our home and garden is. The snacks were sausage and vegetable rolls with sesame seeds, hummus, baba ganoush, a selection of French and local cheeses, pickled onions and cucumbers with crackers. The main meal was roasted Black Angus beef fillet and roast lamb cooked on a spit roast in the backyard with roasted vegetables, potato bake, peas, corn and gravy. There was spinach and ricotta pie for the vegetarians. Dessert was the wedding cake, made by Shane - a white chocolate and almond cake (no flour) with white ganash and marzipan, served with raspberry coulis and vanilla ice cream. Many people complemented us on the food and I have to say it was delicious. Best man, Nathan, was a great help. He worked the previous night with Shane prepping vegetables and on the day cooking the meat. There were a half a dozen fine dining chefs there, so we had no problem serving up the menu. After the main meal we had some lovely speeches, followed by the dessert and dancing. And then babies were being bedded down in the house, Alice wandered around being fed with the leftovers and our home was full to over-flowing with laughing and good cheer. I will never forget that night. Tricia did a wonderful job with the flowers, it was her gift to Shane and Sarndra. 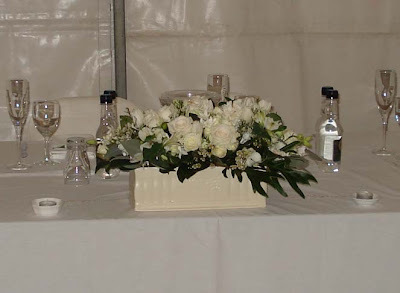 Sarndra's bouquet was made up of white roses, white orchids and white hyacinths, the bridesmaid had one similar. White flower circlets surrounded candles on the tables and a beautiful arrangement in my antique long vase sat on the bride and groom's table. There were fairy lights on the back verandah and rice paper lanterns in the marquee and all that soft light added to the magical feeling of the evening. It was quite a day. The next morning, for the first time in years, I slept until seven. I'm still tired now, but I have to go back to work today and even though I'm tired, I've missed being there and I'm looking forward to it. 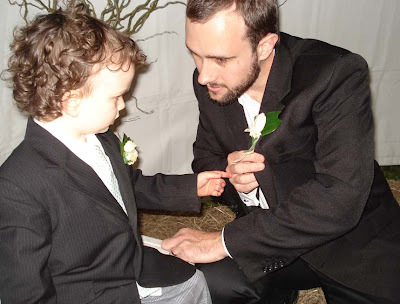 Shane explaining the flowers to Noah. On the night before the wedding there was a program on TV about backyard weddings. 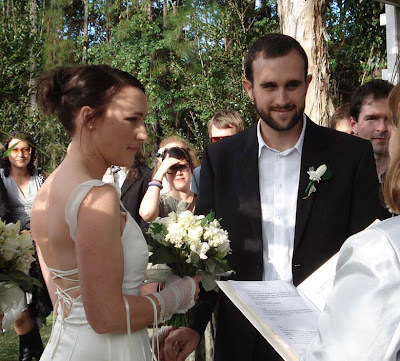 :-) They said the average cost of an Australian wedding now is $40,000! Ours cost a small fraction of that and it was just so beautiful. 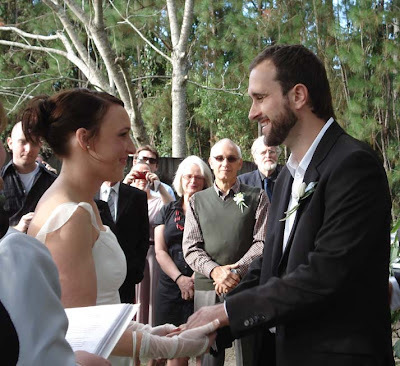 Many guests said it was a wonderful wedding and a couple said it was the most beautiful garden wedding they'd been to. It was nice to have those comments to affirm what we were thinking. And the special project I was working on before the wedding was a wedding quilt that Hanno and I presented to Shane and Sarndra as their wedding gift. I'll write about that another day. I hope you enjoy the photos. Shane and Sarndra, just before they said: I will. I bring a message of hope. There are signs of change on the horizon. I noticed these signs about six months ago, as I'm sure many of you did, but thought they held little promise. However, it looks like things are different this time, this seems to be more deeply embedded in mainstream culture, and now I believe change is on the way. And the change is the belief of ordinary men and women that they can modify their materialist lifestyle to that of a more prudent and accountable one. I remember back a couple of years ago when I heard a report about climate change and peak oil on the 6pm news. Well, that nearly flattened me. I was so surprised that the report was on, I called Hanno to see it. He probably thought I was a bit mad but there it was, what we'd been talking about for so long but in all that time I'd never heard one word of it on the mainstream media. Ha!, I thought, fancy that, never dreaming those reports would become commonplace in just a few short months. And now on Oprah, I find that back in January an article called: Back to Basics, Living with Voluntary Simplicity. was featured in the O magazine. Far out! That is about as close to middle America as you can get. 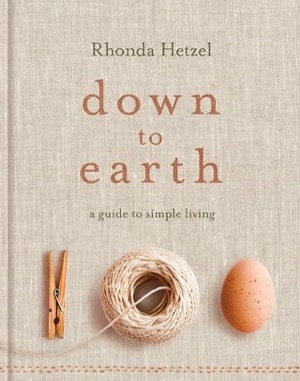 And in February she did a TV program on What can you live without?, in March, she did another on Simplify your Life. I mean no disrespect but America was the last major player to arrive at this change; European countries and some of the Commonwealth countries - Canada, NZ, Australia had been working towards cutting back, simplifying, gardening etc, well before the US, en masse, saw the need. However, I have always believed that without America, any change it would be short lived. The amount of wealth in America, coupled with the potential to spend it, as well as the amount of energy consumed there, made it imperative that the US saw the need for change as well. And it took the economic crisis to bring that change to the people. Those of us who have lived this way for a few years would know that five years ago, the only literary references to living a simple life were in books and blogs. Now there are magazines and TV programs and all sorts of references in popular culture. I know mainstream media don't lead, they are followers, so it's very heartening to know they now providing what their audiences are asking for - more information about living more simply. I'd be interested to know what you've seen in the popular media about cutting back, living within your means and being at home. I'm sure there's a lot more out there that I'm aware of. I don't buy magazines any more so things do pass me by. So tell me please, who is writing about what? 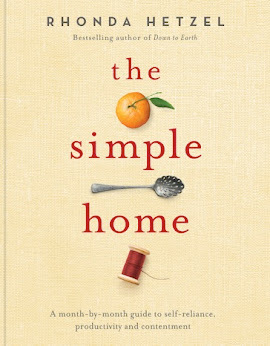 I think we all have our favourite simple living blogs, so I'm not interested in blogs at the moment, what have you seen on TV, in newspapers and magazines? Please give us some links if you can so we can build up a point of reference that we can all read through as time allows. Do you think, like I do, that the times they are a'chanin'? I have no doubt that when the economy improves, many of the new frugalistas will go back to spending but I think there are millions of people now who have seen that the grass can be greener on the other side of the fence and when they have more money to spend, they may not be tempted back. I think a genuine change has happened, do you? Life can be hard sometimes. We're working towards our big event this weekend. Hanno's done a lot of gardening and preparation outside, I've worked inside and that will continue until Saturday when we get the most wonderful pay-off for that hard work by seeing our son marry right here in our own home. You rarely get the good things without the work. It's like the simple tasks of soapmaking and composting - you put the ingredients in, add the energy and out comes something much better than what you started with. The hard work pays off, in soap making, composting and life. I'm a working class woman. I might not slip easily into that category in terms of my education and previous earning capacity but in my mind I am, and will always be, working class. It is my heritage and my inclination, and I wear the badge with pride because I believe I have become the person I am because of the work I do. I have to tell you though, I don't enjoy all the work I do, but I enjoy most of it because I can see the rewards it brings, and it makes me who I am. I would be a lesser person without the work. Maybe that was one of the reasons I was drawn to this simpler kind of life; maybe it was the work that attracted me, because there certainly is a lot more to do living this way. But I see that as a gift. Having productive work to fill the hours is not the hardship some make it to be. It is simply what it is - the work of life. I would rather spend my energy sweeping my floor, hanging the laundry on the line and gardening than walking around a shopping mall looking for things to buy, and then battling traffic to bring my bounty home. I would rather work to help provide a warm and loving venue for our family wedding than pay someone to do that for me. Our work this week is part of the wedding and we won't have the wedding we want without it. I had an email from a young woman last week who wrote that she wants to live simply but she doesn't like the work and is there an easier way to do it? I'm not sure how to answer that question because for me, no, there isn't an easier way to do it, but my way won't suit everyone. I've said this over and over again, there are many ways to live life - simply or not, and you should all live how it suits you. There are role models that you can learn from but in the end it is your life and you should live it as you see fit. But I encourage you all to try this coat on for size - this simple life coat may not fit all comers but if it does sit well on your shoulders it is a fine way to live. Of course, not everything I do will fit into your life, and some of the things you do wouldn't fit into mine. But that's good - that is part of the whole idea of it, that we are all different and we live accordingly. 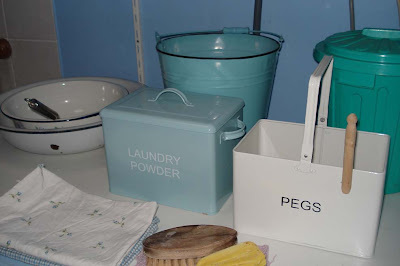 Don't be hoodwinked into believing that fashionable clothes or household goods are the answer. You will be forever buying the newest must have and paying for the privilege of it. Don't look at your neighbours with envy because they've just installed a pool or drive that new car - they probably have debt as big as their egos. And don't feel bad because you're working hard - it might be the making of you, just as it has been for me. And for those of you who can't work as hard as you would like, do what you can and be pleased with that. We all know there are times, for all of us, when you just can't do the work ahead of you and if you are at that point now, accept it and do what you can, when you can. But if you are capable and healthy, embrace the work you do, either at home or at your paid job, and know that what you do not only produces it's own reward, it makes you stronger and will, over time, change you for the better. How do you feel about the work you do? Is it part of you or do you see it as a necessary evil? It's a mystery to me why all gardeners don't make their own compost. It is an important part of gardening, will help enrich your soil, and it cuts down on the amount of rubbish that sits decomposing in the council rubbish dump. 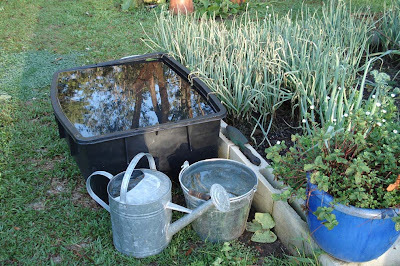 Why send your kitchen and garden waste to the dump to decompose when it would help you grow vegetables and flowers while contributing to the health of your soil? Of course, the way you compost will be determined by your climate, how much waste you have to compost and how much time you have to do it. If you aren't composting now in some form, and have the means to do it, I hope you'll think about it now and give it a go. I have written about compost a few times before here and here, so this post will be the odds and ends associated with composting and, hopefully, a motivation for you to start composting if you haven't done so already. Our compost bin surrounded by volunteer cherry tomato seedlings. There is a hierarchy of household waste that I've written about here. When you think about this hierarchy, also think about the wildlife you have in your backyard. If you have rats, mice, possums, foxes, coyotes, bears or wild cats, you'll have to be careful not to put food in your compost heap that will attract those animals. Generally it's a rule that you don't put meat or dairy products in the compost heap as this will certainly attract animals even if you've never had any in the past. Attracting animals with your compost is a problem in the country and in semi rural areas, but even if you live in the middle of the city or in the suburbs, you'll attract cats and rats if you continue to put meat out. Flowering comfrey. This herb helps speed up decomposition. Remember there is more than one way to recycle waste. 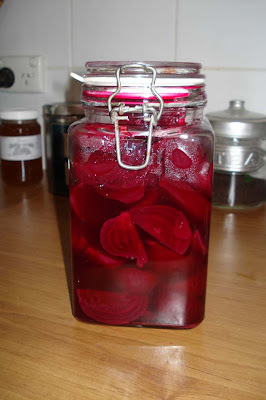 You could also build a worm farm, or use your chickens or dogs to recycle some of your kitchen scraps. Chooks love to eat meat and chicken, and they love eggs, old bits of toast and cake and all forms of dairy. If you give these tasty morsels to your chooks, it will increase their level of protein food and, hopefully, their egg production. Bathrub worm farm in the bushhouse. If you have chickens, dogs or worms, you'll need to decide where your kitchen waste will go. The hierarchy again! If you have meat scraps or any other food that would attract the wildlife in your backyard, give those scraps to the chooks or dogs straight away, it will supplement the food you generally feed them. If you're going to compost, start by putting a small container, with a lid, in the kitchen in which to put your compostable kitchen waste. This will hold all your fruit and vegetable peelings, crushed or pulverised egg shells, tea leaves or tea bags and coffee grinds. 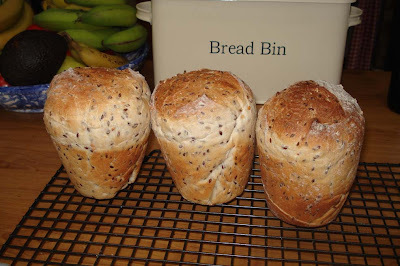 Empty the little container every day into the compost heap or bin. Our stockpile of dry material - shredded paper. 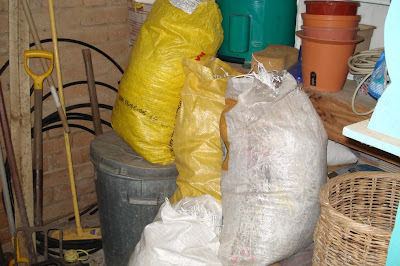 You will need a lot more dry material for your compost than wet material. Read about the importance of this in the links above. Dry material can be old newspapers, cardboard, old telephone books, junk mail, worn out cotton dishcloths or clothes, hair, feathers, wool or any other worn out item that is not man-made. Plastic and polyester will not decompose. You'll need about two thirds dry to one third wet material, so if you can gather a lot of these dry materials, you'll have the beginnings of a good compost heap. You'll need to keep your compost moist, not wet and you'll speed up decomposition if you add comfrey or comfrey tea to your heap. Make the compost according to the information provided and your own climate and conditions, add your kitchen scraps, and turn the material over to incorporate air and you're on your way to good compost. 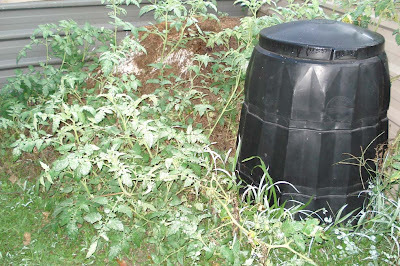 Composting is an ideal activity for those of us who live simply. It reduces household waste and it helps us use what we have to its fullest extent - from new, right through until it decomposes and returns to the earth. It helps us see waste in a more productive way, instead of giving it to someone else to take care of. 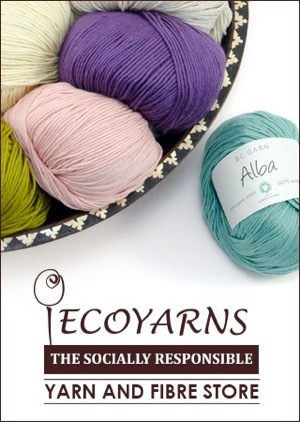 It encourages us to feel responsible for what we bring into our homes - we look for natural products that will be compostable in a few years time instead of buying plastic or polyester. But most of all, I love composting because it allows me to take full responsibility for what I buy. If it comes here, I want it to stay here and not be part of the growing problem of landfill. I hope I've encouraged you to think about composting in some form. 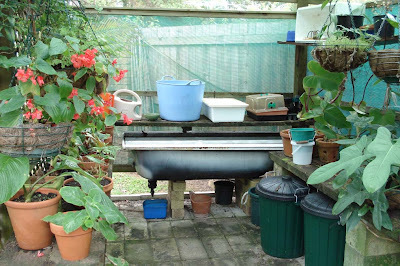 There are few hard and fast rules for composting, each climatic zone tends to come up with it own innovative solutions. If you're composting already, I'd love to know what you're doing. I am always open to new ideas and keen to learn. Good morning! This time next week it will all be over. Our wedding is next Saturday and we are calmly (I think) moving towards the big day. My special project will be finished tomorrow, we've ordered everything that needs to be ordered, the flowers will be picked up on Wednesday and the cold room and food on Thursday. 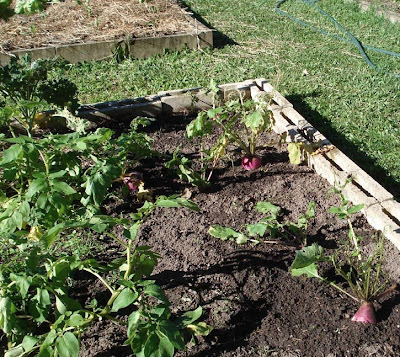 On Friday we'll have a working bee, with people coming to help prepare and peel vegetables and make "things". Yes, it's all going to plan. I've had a few people ask if we're stressed and I can truthfully say we aren't. We're working to a plan and doing a few things each day and, so far, nothing has gone wrong. My sister Tricia is here helping us and as we get closer to the big day, we are all looking forward to it very much. I'll tell you more about it after the wedding but I can tell you this right now. I am very proud of Shane and Sarndra because even though they have friends who have had recent "big" weddings, they have kept to their budget, bought a few things each week as they were paid and they are on track for a beautiful wedding, surrounded by people who love them, that will be celebrated without a financial hangover. 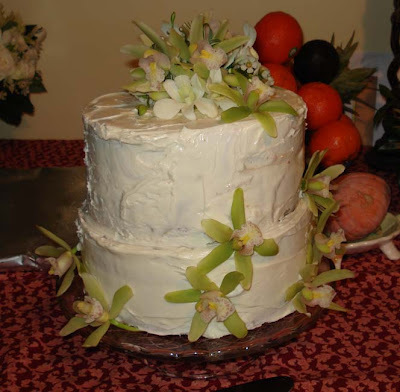 We only have a few important celebrations during our lives - new babies, weddings, graduations, I am thankful that this wedding has been handmade from scratch by our family and friends. 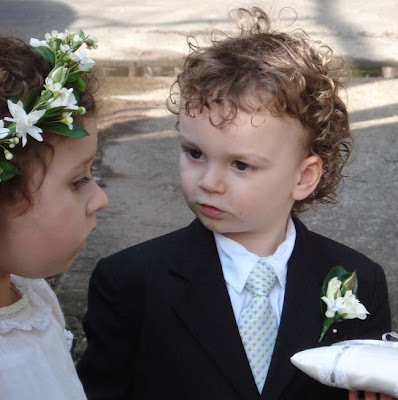 This truly is a family wedding and it promises to be a beautiful one. I hope you're enjoying your weekend. Take some time for yourself whenever you can to recharge your batteries for your work next week. I'll see you again tomorrow. 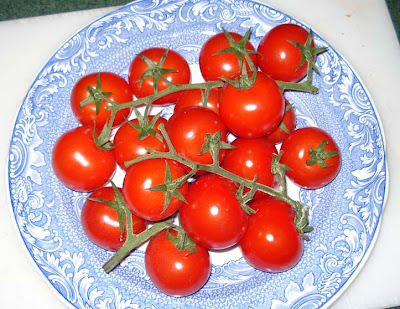 If you planted a tomato into virgin Australian soil (and probably most other virgin soils) and watered it, it might live and produce small tomatoes, but it wouldn't thrive. To get the best from your plants you need to help them along. The old saying of organic farmers world wide is "feed the soil, not the plant" and by this they mean it's best to add old cow, horse, sheep, goat, pig manure, compost or organic matter to improve soil structure and add microbes to the soil, than it is to fertilise plants in unimproved soil. If you're going to be gardening for many years, even sandy and clay soil will improve with these additions, and it's better to garden in soil that's alive and healthy rather than just use the top layer that you add each year. 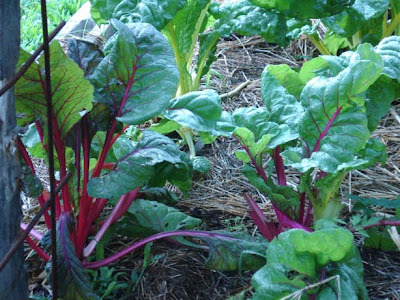 Once you've improved your soil, and even when you're in the process of doing it, you'll be able to plant up a wide variety of vegetables that will take advantage of your work and result in healthy, organic produce for your table. 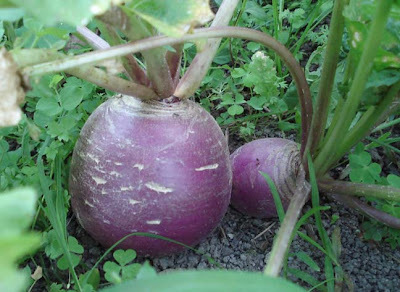 Fertilising is one of the skills of organic vegetable gardening. It's worthwhile giving this a bit of thought because if you get this right, you'll be looking at abundant crops rather than meagre ones. One of the good things about organic fertilisers is that many of them can be made in your own backyard, and will therefore cut down the cost of your garden. Garden and kitchen waste can be turned into compost or fed to worms, you can grow comfrey to make a nitrogen-rich tea. Comfrey also breaks down the soil it grows in by sending down a long tap root to mine the minerals contained deep within the soil. Most of those minerals will be in your fertiliser. Aged chicken or animal manure, and manure mixed into compost, make fantastic soil additives and will increase the amount of available nitrogen and microbes in your soil. Foliar feeding is the fertilising of plants through their leaves. You do it by making or buying a liquid fertiliser to the required strength and, using a watering can, pour the liquid over the plant. 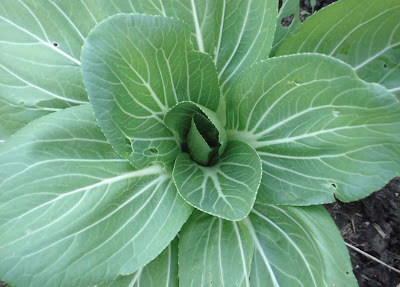 Plants can absorb a large amount of their nutrients through their leaves. However, some plants do not like this form of fertilising - tomatoes, pumpkins and zucchini come to mind, but most leafy green vegetables love liquid fertiliser. When making up a commercial liquid fertiliser, be guided by the instructions on the bottle, but make it weaker than they suggest. A weaker brew, applied more frequently, is a better option. So, for example, if they recommend 1 cap full of fertiliser in 10 litres (quarts) of water, applied every month, make yours ½ cupful in 10 litres and apply it every two weeks. You will get better growth that way. 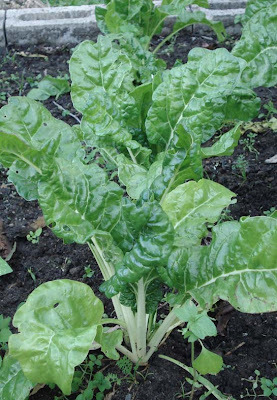 Leafy greens usually need to grow fast for better taste. 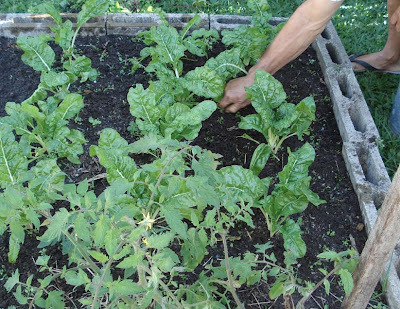 Lettuce, spinach, silverbeet, cabbage etc will do really well if you plant them in rich soil, full of compost, aged animal manures and organic matter, and water them every week or two with a weak compost, worm or comfrey tea, or fish emulsion. So with leafy greens you can give them nitrogen in the soil and a foliar feed over their leaves to keep them growing fast. They will do better if you plant them in rich soil with an application of sulphate of potash to the planting hole. When you plant the seedling or when the seedling emerges, water it with a solution of seaweed tea, made according to the instructions on the bottle. This is more a plant tonic than a fertiliser and it will help your plants cope with a wide range of conditions as well as help them access the available nutrients in the soil and grow good root systems. Don't give fruiting vegetables too much nitrogen and don't give them foliar fertiliser because they'll grow a lot of leaves but give you no fruit. The line is fine here - you want a good healthy plant capable of supporting strong growth and fruit but you don't want to over do it. So good soil + seaweed + watering around the base of the plants - don't water these plants over their leaves, you'll be inviting trouble if you do. 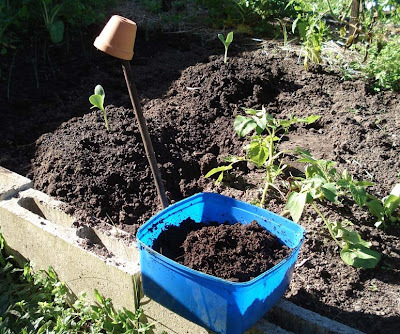 If you have any worm castings, put some in the planting hole or around the base of the plant later on, and cover it with mulch, or make worm tea. The instructions for doing that is in the link below for home made fertilisers. If you're hoping to make your own nitrogen fertilisers, I encourage you to get some comfrey root and plant it at the edge of your garden or in a large pot. 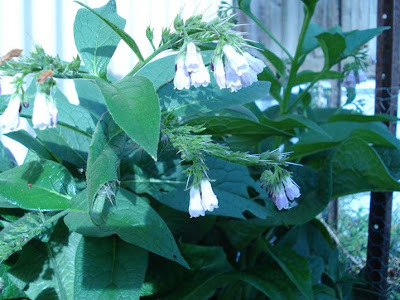 Comfrey leaves can be used for several purposes in the garden - to make nitrogen fertiliser tea, as a mulch for potatoes and to accelerate decomposition in the compost heap. It's a valuable herb. 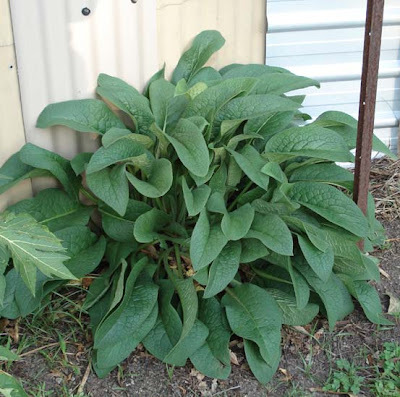 Many people think it's an invasive plant, and it is in a way but it won't take over your garden. It's a clumping plant and it will stay in the area you give it, but if you decide to remove it, any little piece left behind will reshoot. So make sure you give it a permanent position, or plant in a container. There are many other nutrients necessary in the garden but the fertilisers above are the main ones and they'll get you started. In a couple of years, when you want to learn more about fertilisers, find a good book about organic fertilising and do some reading. It's an interesting subject. And remember, soil improvement and fertilising are ongoing tasks, just like watering and pruning, and are part of every gardening season. I think it's wonderful that there are a lot of new vegetable gardeners now. Growing food is part of a new way of living for some, it helps others keep to their budget, and some people see it as a healthy activity producing organic food for the table. Whatever the reason, producing some of your own food is a good thing. It gives us life skills, it's a great activity to enjoy with the kids and it takes us into the natural world outside our door everyday. But vegetable gardening is a complex simple activity. It requires an amount of expertise and skill to be good at it. That comes with time, by simply gardening every season. Each year you learn new things, it's an activity for the brain as much as it is those other wonderful things. If you're a new gardener, I encourage you to buy a very good organic vegetable gardening book that is suitable for your area. The one I use here most often is Lyn Bagnall's Easy Organic Gardening and Moon Planting, but I also like, and often read, Linda Woodrow's The Permaculture Home Garden. You don't want a book full of pretty pictures, you need one that has good practical information about gardening in your climate. If you have no reference book yet, check out your local library to see what they have or ask your local gardening club which of the organic vegetable gardening books suits your area best. Once you have your book, read about soil types, worms, compost etc, but about what you're about to plant. If you're doing the 3x3 method, read as much as you can about those nine vegetables. A good book will give you information about soil conditions, seed or seedling spacing, fertilising, plant growth, plant maintenance and harvesting specific to each of your vegetables. 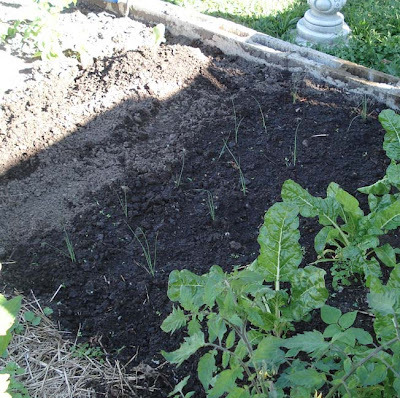 The thing that will help most with growing vegetables is to plant them in good soil. You don't have to start off with good soil, we didn't, our soil is clay, but over the years, because we added compost and organic matter each year, it's turned into the most beautiful loam. The range of soil goes from sandy, to loam, to clay. Sandy soil has very little organic matter and will therefore be unable to hold water, support worms and microbes or provide a suitable growing medium for your plants. Treat it with organic matter and compost - mulch your plants with straw or hay, it will break down and add organic matter to the soil. Loam is good for most vegetables. It has an amount of organic matter, good structure and will support the unseen life of microbes and worms. To keep it that way, add compost every year, and mulch your plants with straw or hay. Clay is full of nutrients but the structure is so dense, it doesn't allow air in or water to drain away. The solution? 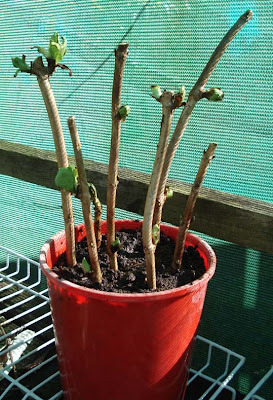 You guessed it - add compost and organic matter, with a bit of gypsum. That will break up the clay and give you excellent soil after a couple of years. If you have deficient soil that you want to plant in this season, there is a way. Either build a no dig garden or dig compost and organic matter into your entire garden and plant into pockets of pure compost. The second option would be my preference. After a few seasons doing this, you'll eventually improve even the worst soil - either sandy or clay, and you'll get wonderful healthy vegetables. BTW, organic matter can be many things like old grass clippings, worm castings, shredded newspaper, vegetable peels, straw etc, or a combination of all of them - you need to dig it in well. The best kind of organic matter is compost which is all those things previously mentioned that have been wet and allowed to decompose. The structure of compost is very similar to that of loam so it gives the tiny seedling roots a good medium in which to grow. If you're serious about your gardening, I encourage you to build a compost heap. Not only will it give you valuable compost, it will help you reduce the amount of "rubbish" you put in the garbage bin. Tomorrow, I'll write about fertilising leafy green vegetables and fruiting vegetables because some of you mentioned recently that you over fertilised. The following day I'll write about making compost in the backyard. Don't expect to have perfection or success with every thing you grow. Gardening is a natural process that we can assist but not control. The best way to approach gardening in the first few years is to plant only what you can manage, plant what you eat, and learn as you go. I learn new things every year and I've been gardening for yonks. Being a gardener is like joining a secret club full of generous people who will help you whenever they can. Your part of the bargain is to help others in years to come. If you can do that, you'll be a true gardener and worthy of the title. We live in a bit of a retro world here. Most of the time it's not like we're living in the 21st century, it's more like a time from the past when neighbours knew each other and people say hello as you walk down the street. When we close our gate, time doesn't matter at all and we could be living anywhere, at any time. We make our own experiences and memories within our boundary fences with little influence from whatever is outside. There is a special feeling of isolation living here in the hinterland but when we cross that line that cuts our hinterland off from what is known as "the coast" it's like stepping nervously into another world. I'm glad I don't do that too often. There have been lots of changes since I was last at the mall, the crowds of wandering people are still there but we bought what we went for - some clothes for Hanno to wear at the wedding, ribbons and lights, and then we were out of there. It felt good to cross back over the main highway again and thread our way through the pine forests, back to familiar territory. We travelled up the mountain late in the afternoon to collect the little bus from the Centre I work at so Hanno can be off early this morning. Today we'll have another day out. Hanno will drive into Brisbane soon to collect 11 international visitors who are attending the Building Community Centred Economies conference. They have chosen to spend the day in our town to see how we live. We have a community bank that invests in the community instead of taking profits, we have several co-operative trading enterprises, a permaculture village as well as a couple of other communal living villages, a co-op restaurant and generally a well functioning, self-supporting town. The delegates will visit several of these enterprises, then my Centre, and after that we'll take them to a heritage listed park, with gorgeous views, for a BBQ lunch. It will be a busy day but one that I think we'll enjoy. We'll be showcasing our community and providing hospitality to our visitors and even though these people will just see us as helpers on a bus tour they've decided to take in a foreign land, today they will be part of our simple lives and I think we'll be better for the experience of it. And now I'd better get a wriggle on. I can hear Hanno making a cup of tea so I'd best start my chores, one of which is making a ricotta and spinach pie for any vegetarians we have in our company today. I hope you enjoy your day too. Take care. When you first take up your trowel and fork and start planting vegetable seeds for the first time there is a very strong tendency to overdo it or to dive in with no thought of order, outcome or orthodoxy. When the gardening bug grabs you, you're in it for production, nothing else matters. Or does it? 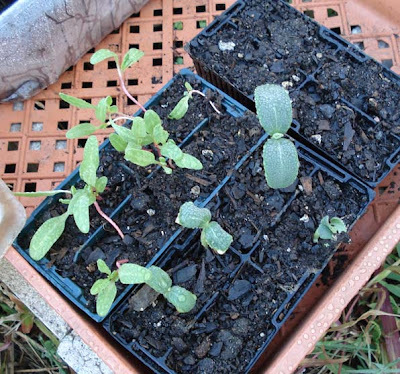 It will help you considerably if you can think a little about what you're about to plant, because if you're in your early years of gardening and you over do it, or go through a season with few vegetables making it to your kitchen table, you might give up. And I don't want that to happen. 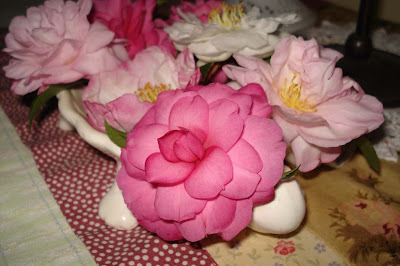 NEVER give up because it's too difficult - in gardening or anything else. You just need to think about your planting in a different way, work out your strategy and start again. You learn the best lessons from your own mistakes or when times are tough. Of your listed vegetables, work out, by reading your book, what can be easily grown in your climate at this particular time of year. Remember, no matter how dearly you want something to grow, it won't grow out of season. That, my friends, is a good novice vegetable gardener's list. 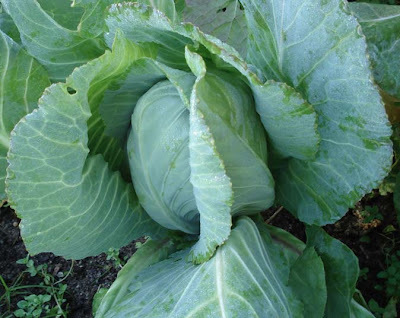 They could be different in your garden but if you have three vegetables that you are really keen on, three from the same family, so they require similar care; and three easy crops, you'll be eating your own produce before too long with a minimum of fuss. 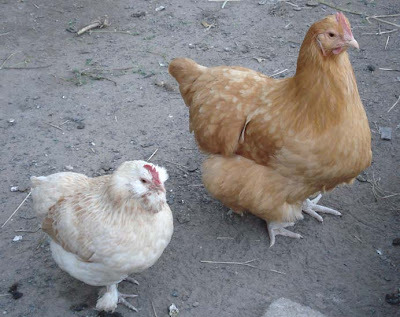 Our little French hen Heather (salmon Faverolles) with her best friend Martha (buff Orpington). Before planting though, you have to work out how many of each plant you need. As well as being eaten fresh, your tomatoes, beans and peas can all be either blanched and frozen or made into delicious sauce or relish, so plant as many of them as you can manage. The onions and garlic will store well and when you harvest the leeks, just cut them at ground level and they'll keep growing. So plant plenty of garlic and onions and not so many of the leeks. 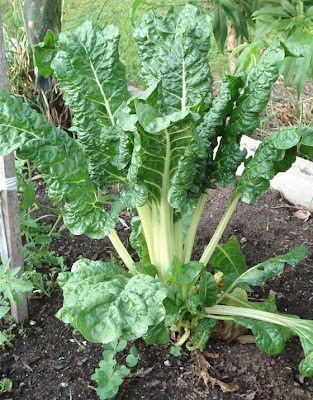 Swiss chard can be frozen, as can cauliflower, as well as being eaten fresh, so plant plenty of them. And with the lettuces, if you eat two per week, plant six for three weeks, and plant your follow up seeds two weeks after planting. 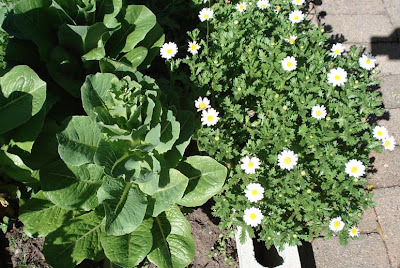 If you intend to grow lettuce all season, plant eight seeds every three weeks - throw out your two weakest seedlings. And for the rest of it? Don't fret about what you can't grow. Appreciate your successes and focus on growing as many of your favourites as you can. Find a market where you can buy fresh inexpensive produce and buy what you can't grow. However, always keep in the back of your mind that as your gardening skills develop, you may be able to progress to the more difficult crops later. Creating micro-climates can sometimes protect a crop that normally might not grow in your area. Each year add a new batch of three, read your gardening book so you know what conditions they need and aim at producing good quality vegetables using organic methods. Comfort food usually makes a comeback whenever the economy does a nose dive. We also tend to use more of the cheaper cuts of meat, waste less and shop more for bargains. I was reading an article from Australian Food News about 2009 food trends recently. All the above were mentioned as this year's trends, as well as an increase in entertaining at home, more community food projects and, paradoxically, more food delivered by mail. Hmmm. Many of the trends in that article are strategies that Hanno and I use and it reaffirmed for me that living simply is generally a sensible way of life. 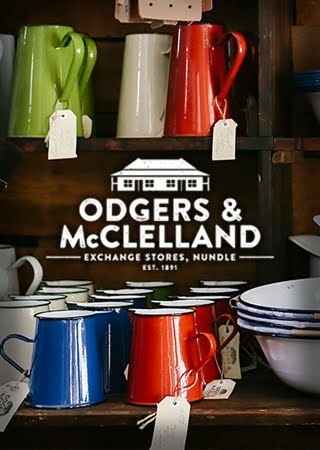 Being frugal in all manner of things - our shopping, growing food, mending, knitting, sewing, being satisfied at home, paying off debt and cutting back whenever we can, helps us through a recession like nothing else, and it makes sense not only in bad times but also in good. It made me think about how much we have changed; that we are conservers now instead of consumers. We were due for that change, overdue, in fact. All that money wasted, it makes me shudder just to think of it. But now Hanno and I are well and truly embedded in this way of life. 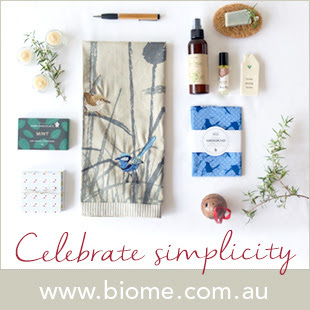 It feels natural to us now to economise, save, reuse, mend and recycle. It is now part of how we live and who we are. There is no going back for us. We are here for good. But what about you? When all this kerfuffle is over, when the credit is flowing freely again, when McMansions are once again being touted as "THE place to live", will you be there knocking at the door? According to this article: "Three quarters of shoppers who have made changes to their food and grocery shopping due to the economic climate say that they will stick with their new habits even when the economy recovers, according to new research from the UK." That's great news. But what about you? All these months of learning how to grow food, bake bread and shop wisely, all the talk about "saving the planet", peak oil, climate change, frugality and slowing down, will that all be forgotten, or if not forgotten, at least crushed and broken in the rush to the Christmas sales? How committed are you? Have you skilled yourself just for the recession or have you done it for life? Often when I asked questions here I already know, or think I know, the answer. I have no idea about this. All I know is that my feet are cemented to the position I take today - that we are in this for life. But I really don't know about you. How firm are your feet planted? Please, let's have an honest discussion about this. I find it very interesting and I'd love to know your opinion. The work of the homemaker is getting tougher. We are battling hard economic times and trying to stick to our budgets while food and fuel prices are increasing almost every week. Some homemakers who work outside the home as well are faced with cutbacks and job losses. SAHMs are raising children and running their homes, some are doing that easily and gracefully, others feel guilt that they aren’t contributing to the family’s income, or suffering the criticism of “friends” that they should get a job. Let me say this clear. Homemakers - women and men, are an essential and significant part of who we are as a society. Whether there is recognition to attest to that fact or not, they are the glue that holds us all together. Yes, we need commercial enterprise and entrepreneurs to keep our nations moving forward and commercially viable. We need big business to provide some of the products we use. We need to maintain our civic responsibilities, support our law enforcement and armed services organisations, we need to elect honest politicians. But unless we form stable families on which to build those civic institutions, we won’t amount to much. Families are the foundation of our nations. 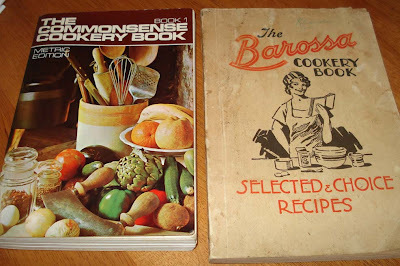 Commonsense and CWA (Barossa edition) cookbooks. The CWA cookbook was my mothers. It is tough, no one is denying that, but we can make it better by supporting other homemakers. Be proactive. Invite a new neighbour in for coffee. Take a magazine and flowers to your sick neighbour. 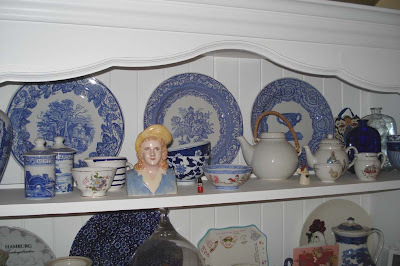 Encourage other homemakers in their work. Share recipes and tactics. Take the washing off your neighbour's line if it starts to rain while they're out. Show younger homemakers that while this job is difficult, never-ending and unpaid, it is also incredibly satisfying, enriching and wonderful. Lead by example, guide others with your strengths and accept assistance when you need it. Be the friend you want to find. Make your mark, stand tall and know that your contribution is important. Providing comfortable and secure homes for ourselves and our families places our children and working people on solid ground. We are the ones sending them out willing and capable of making the most of their work and school; we are the ones setting the tone for what they will become. I am not stupid enough to believe that our children grow up to be our mirror image, but we can have a significant input into the type of people they become. Model the behaviour you want to see in them - teaching kindness, generosity, tenderness and humility help build character and form a stable foundation on which to build a life. Show your children that you enjoy life and that your family makes you happy. That will be your greatest gift to them. Show them the benefits of hard work. Be proud of your work and show it. Not everyone is cut out to be a homemaker, so for those of us who do this important job it’s essential that we understand that it’s not inferior to any other job. It is nation building. I hope there will be many things of which you will be proud when you’re my age. If you can say you launched your children into the world as decent people; if you can say, that most of the time, you did your best; if you know that you supported and encouraged other men and women in their tasks; if you know that you helped build a strong and supportive community, you will have done a fine job, not only for yourself and your family, but for your country as well. Fairy cakes were baked last week. We've had a few busy days here. I sent my book proposal off to New York again yesterday afternoon after doing the corrections suggested. I really love working with my agent, Abby. She has some wonderful ideas and we are working very well together. I'm not sure when the book will be out, it's at least a year away. During that time, I'll be working hard to produce the most interesting, helpful and motivational book I can, so bear with me. As usual, many other things are happening in the background. Last Saturday I spoke about blogging at the Reality Bites non-fiction book festival. There were two other speakers with me - Matthew Cashmore from Lonely Planet and Sarah Stewart, who has an educational blog on midwifery. In the days before that, I was interviewed a couple of times on local radio to publicise the event. I'm not sure how I came to be spokesperson, and I did forget about one of the interviews until they rang to do it, but overall, it went over well. Our black girls on insect patrol in the backyard on Saturday morning. 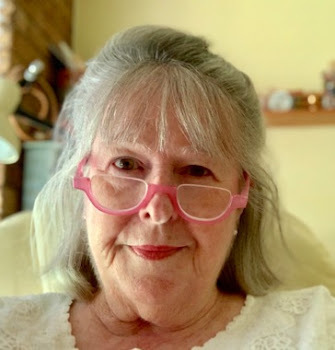 I am still working on my special project and am really pleased that my sister Tricia will be here next week for the wedding, and will help me finish it off. When I have time, I'm knitting. I have about 30 squares for my shaker style rug now and I'm just finishing off a pair of long fingerless mittens. We have a wedding rehearsal this Saturday that I'm looking forward to. As well as the rehearsal, we'll be checking the lighting and showing Shane and Sarndra the garden that Hanno has prepared; today we expect almost 300 panolas (they're like pansies) to arrive from the wholesaler. Hanno wants to plant them along the driveway, with a few out the back beneath the lattice. The lattice at the end of the front verandah, and where the passionfruit and grapes grow at the back, will have fairy lights threaded through them. I think it will look really pretty. 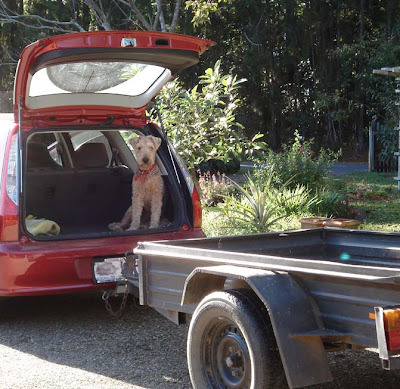 But today Hanno is driving into Brisbane's Foodbank to pick up supplies for our Neighbourhood Centre and I am mending, sewing and tidying the house. An acquaintance of mine told me recently that she was bored and hated retirement. I can't imagine that, there is so much to do, so many opportunities. Hanno and I are having the time of our lives and for those of you moving closer to retirement, I recommend it to you as a time of renewal, activity and generosity. Don't be afraid to change your life when you retire. There are no rules now, your days are your own, and what you spend your time on can fill you with joy and hope for the future. 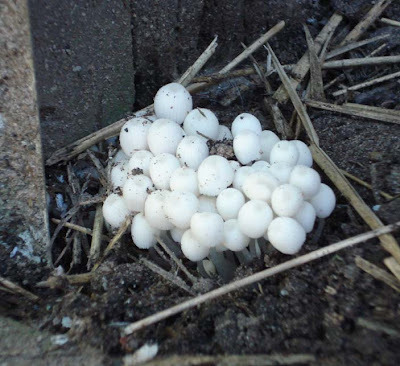 Strange mushrooms growing on the wood in the chook house. Do you know what they are? 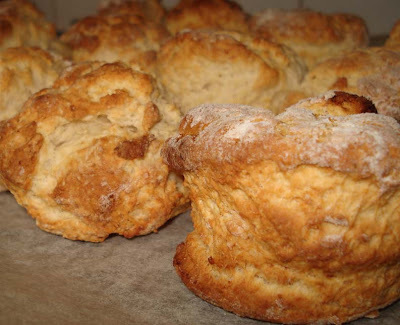 And finally today I have two recipes for the same biscuit - the Anzac. Anzac stands for Australian and New Zealand Army Corps and these biscuits have a very interesting history which you can read here. If you have a loved one deployed in a foreign land, maybe you'd like to send them some Anzacs, along with the printed history of them. I am sure any soldier would welcome an Anzac biscuit and enjoy reading about fellow soldiers from long ago. A photo of my Anzacs is here. Recently Cath in Sydney sent me her late grandmother's Commonsense Cookery Book. Thanks to Cath, and her mum, who posted the book to me. I am very happy to have added it to my collection of cook books and I'm slowly reading my way through all the recipes. I used the Commonsense recipe for my biscuits. 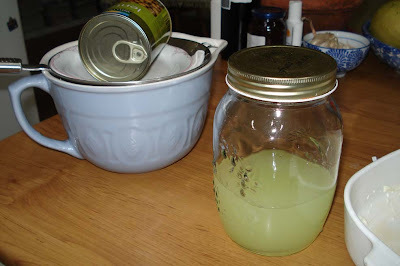 Mix bicarb with boiling water and add to melted butter and syrup. 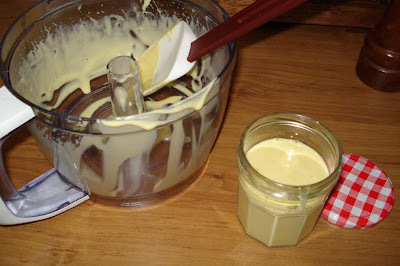 Place tablespoons of mixture on greased slide. Bake in slow oven 150 - 160C (300 - 320F) for 20 minutes. 1 cup sugar, 1 cup coconut, 1 cup rolled oats, 1 cup self raising flour. 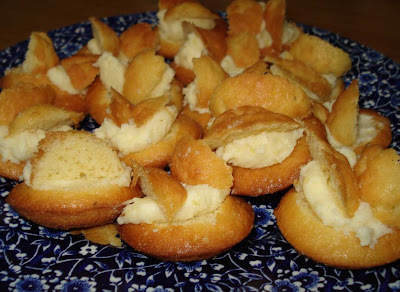 Put 2 tablespoons water, 1 tablespoon golden syrup, 2 oz (¼ cup) butter in a saucepan and bring to boil. Then add ½ teaspoon baking soda. Pour over the dry ingredients while hot (care must be taken that it doesn't boil over), put teaspoon of the mixture on greased slides and bake in slow over for 30 minutes. Substitute the self raising flour with 1 cup plain (all purpose) flour + 1 teaspoon baking powder and the golden syrup with maple syrup. Cool the biscuits before storing in an airtight container. It didn't take us long to realise that raised vegetable garden beds were better for the type of gardening we do than anything else. We tried flat beds and no dig beds, raised beds that we could dig into and fluff up the soil gave us the best results. So for a long time, at least the last 12 years but probably closer to 20 years, we've grown our vegetables in raised beds. A container of worm castings waiting to be added to the garden. Potatoes can be part of the rotation but can be difficult to place because they are in the same family as tomatoes, so can't be planted for a couple of years before or after in the same bed. 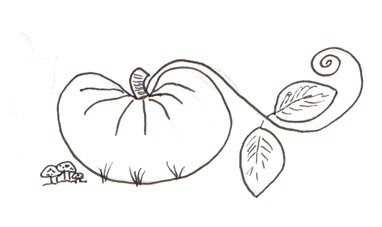 Often potatoes are planted in a their own separate bed, but again, they (or tomatoes) can't be planted in the same bed for another couple of years. We started off with crop rotation, and while we think it's a great system, it doesn't' work for us. We try to keep our garden going all year and often finish a crop and plant a little fill in crop to keep the soil productive until the season changes. 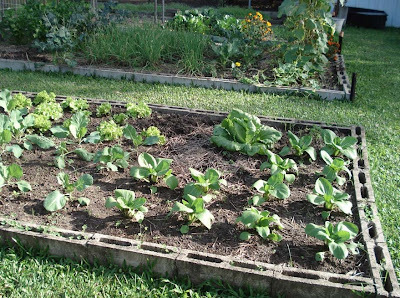 So while we often start off with neat rows, we usually end up with patches of different vegetables. We have found that if we continue to add abundant compost, this system usually works. Our raised beds are edged with cement blocks. You could also use bricks or untreated timber. Make sure the timber is untreated because chemicals will leech out into the surrounding soil and vegetables. A raised bed will contain the soil well, even in a torrential downpour of rain and the soil will warm up, even in winter here, to allow us to plant all manner of vegetables and fruit. The true value for me in a raised bed is that you can dig into the soil, worms can infiltrate your garden and the drainage is excellent. 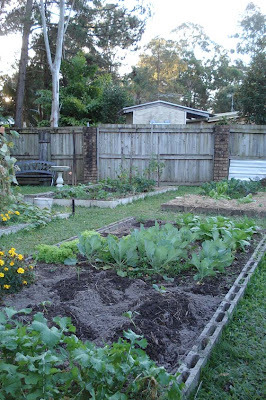 However, you can also build your raised bed on a cement slab if you wanted to and fill the frame with compost and soil. Raised beds are also good on top of clay. You can built the level up a bit with soil and over the years, the continual addition of compost and organic matter will break the clay down. Our garden is built on clay but over the years we've developed excellent fertile soil simply by adding compost and digging it into the soil that's there. If you're starting out new this year with your garden, start with one or two beds, work out your gardening style and practise, then in following years, add more beds, until you have the garden space you need. Leeks grown from seed in a tray and planted out. 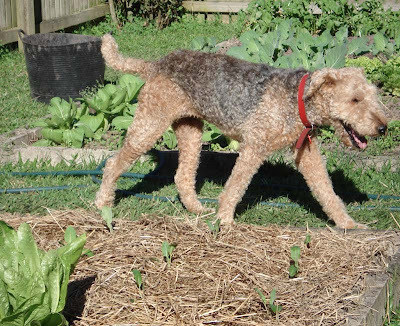 Hanno planted out some new seedlings yesterday - leeks, zucchini and lettuce. Our garden is slow to start this year but is now taking shape. I can see another productive year coming up and I look forward to strolls in the garden in the late afternoon, picking snow peas and eating them in the garden surrounded by creeping vines and ripe fruit and listening to the birds.